A median audio-visual author in Europe earns €18,000 from their work after tax, with an additional €2,000 coming from secondary payments including CMOs. As the Copyright Directive discussions have entered a crucial phase in the European Parliament and Council, FERA and FSE call on EU policy-makers to take a stand to secure effective measures to ensure European audio-visual authors’ fair and proportionate remuneration. Without it, there can be no sustainable future for European audio-visual creation. Although the European audio-visual industries’ turnover in 2012 was € 107.3 billion, we know that, at national level, the majority of creators who produce the copyright goods on which the culture industries are built have extremely unstable incomes that are usually very modest. Investing the time, energy and resources necessary to create, has become increasingly difficult. 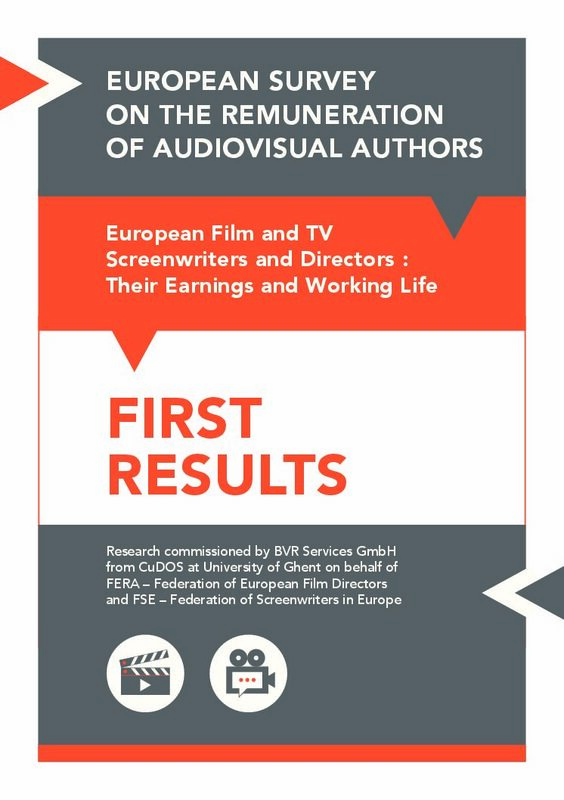 Preliminary results from the first ever, comprehensive, Europe-wide research aimed at mapping out the economic and social situation of European audio-visual authors paint a sobering picture of the brutal economic reality faced by creators in the European audio-visual sector. Including all sources of personal income young authors have annual income of less than €15,000. If they can sustain a career, this rises to €30,000 for men and €24,000 for women at the age of fifty, following which it drops again to less than €15,000 at 65. As a result, they usually have other work either within the industry (50% of authors) or outside the industry (34% of directors and 42% of screenwriters). Audio-visual authors receive about 10% of their income from secondary sources, necessary to bring more stability to mostly freelance and self-employed professional lives, which includes income from Collective Management Organisations. This shows the importance of their initial contract, from which most of their income originates. Nonetheless, while four out of five authors (83%) “would never give up their job”, 81 % of young authors and 56% of established authors say that it is difficult to bargain a good contract. European citizens’ appetite for the films, TV series, documentaries we create is constantly growing. Yet our creative community struggles to make ends meet. It is past time the audio-visual industry and the European Union stop looking the other way while paying lip-service to the importance of creativity and cultural diversity. “The first results of this study are clear : the current economic situation of the European audio-visual creators community is simply not sustainable. The Copyright Directive is a once-in-a-decade opportunity to take concrete action to fix this : we count on the JURI MEPS and Member States to step up.” said Robert Taylor, FSE President. FERA – Founded in 1980, the Federation of European Film Directors gathers 36 directors’ organisations from 27 countries. We speak for approximately 20,000 European screen directors, representing their cultural, creative and economic interests at national and EU level. FSE – The Federation of Screenwriters in Europe is a network of national and regional associations, guilds and unions of writers for the screen in Europe, created in June 2001. It comprises 25 members from 20 countries, representing more than 7,000 screenwriters in Europe. The study, which will be published in full next September, is based on an online survey of FERA (Federation of European Film Directors) and FSE (Federation of Screenwriters in Europe) networks – 57 professional organizations in 26 European countriess. This research project was conducted by CuDOS’ team from Ghent University’s Department of Sociology.